If you received this from someone else, or unformatted, visit our subscribe page to receive this newsletter directly. You can have this translated into your native language by using our convenient translation facility located on the right-hand side of the page. 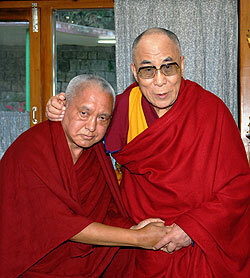 His Holiness the Dalai Lama with Lama Zopa Rinpoche during their recent meeting, December 2011. Lama Zopa Rinpoche with Serkong Tsenshab Rinpoche and Khadro-la outside the gompa at Tushita Meditation Centre, McLeod Ganj, India, December 2011. Rinpoche is in India continuing physical therapy with ongoing help from Khadro-la and Tibetan doctors. On December 16 a special long life puja is being offered to Rinpoche over three days by some high lamas in Dharamsala, India. Go to Rinpoche’s Health – Updates and Practices for more information and to subscribe to our RSS feed for updates. We are happy to share one of the first teachings given by Rinpoche since manifesting a stroke. Rinpoche gave this short teaching while at Nalanda Monastery, France in October this year. One of the enjoyable aspects of this video is that it shows the big improvement in Rinpoche’s speech since the stroke. “His Holiness the Dalai Lama walked through the door. Rinpoche went forward to greet him (not being able to prostrate) and they embraced (this was the first time Rinpoche had met His Holiness since his stroke earlier in the year). The room was very silent and still. They remained embracing each other for what seemed like a long time. Heartfelt thanks to all the kind donors of FPMT’s Charitable Projects. Without your kindness we would not be able to actualize these amazing projects. Although by no means an exhaustive list, project offeings include granting stipends to all the main teachers and abbots of the Lama Tsongkhapa tradition; offering three nutritious meals to the 2,800 monks studying at Sera Je Monastery; building an eye hospital in Tibet; translating Dharma texts into many languages; and offering continual pujas for the success of FPMT and all the students. Thank you again for your kindness. Strong dedications have been made for each donor. Basic Program: Students and staff of the French Basic Programs at Centre Kalachakra and Institut Vajra Yogini have been working hard, spending three months reviewing in preparation for their final exam mid-December. Altogether 16 students will take the exam, which completes the first round of French-language programs. Both centers have already started a second round of BP this autumn. Ven. Ngeunga, French BP coordinator and staff member of the French translation office, has worked very hard to provide translations of the BP texts, review questions and exam files. Basic Program‘s Stages of the Path – Middle Length Lam-rim is now available. Vivir el camino‘s Módulo 03 – En qué creen los budistas está disponible. Audio files of the Lama Chöpa practice led by Ven. Thubten Dechen in Australia during 2011 are now available. NEW! Previously only available on VHS, Remembering Impermanence and Understanding What is True Dharma by Lama Zopa Rinpoche is now available on DVD. NEW! Food Offering Practices, booklet format. Includes Extensive Food Offering and Yogas of Eating According to Hinayana, Mahayana Sutra and Mahayana Tantra. 40 pages. Final Swedish translation of Sanghatasutra is available. Mandala’s January-March 2012 print issue is in the mail! This issue features a piece on Universal Wisdom Education’s Gathering 2011; Preserving the Foundations – Merry Colony and FPMT Education Services; and first-hand accounts of Khensur Rinpoche Lama Lhundrup Rigsel’s last days and hours;plus many offerings from our standard sections which aim to keep the scope of the magazine global while speaking to the common occurrences of walking the path in daily life. This issue’s online content is now live on the Mandala website and features many topical offerings including “What Differentiates Buddhism from Christianity” by Lama Zopa Rinpoche; Jacie Keeley’s Road to Kopan story; an excerpt about the 1982 Enlightened Experience Celebration from Adele Hulse’s forthcoming biography of Lama Yeshe, Big Love; plus much more! International Merit Box Project collections begin on December 20, Lama Tsongkhapa Day, and continue until March 31. You can make your contribution online or check for alternate ways to send in your offerings. If you are not already participating in this wonderful practice of generosity, you may obtain a Merit Box kit for free from The Foundation Store. We are now accepting applications for International Merit Box Project grants! Not sure if your project qualifies? Visit the project website or email meritbox@fpmt.org for more information and to obtain an application. Read the latest Foundation Store newsletter for new product arrivals and monthly specials. While in Bendigo, Australia in March, Rinpoche addressed the directors, spiritual program coordinators, study group coordinators and resident teachers participating in the FPMT Australia national meeting. Rinpoche gave juicy and sweet comments and thanks for the important role of making the Dharma available via FPMT centers, projects and services. The video of this advice in the FPMT Affiliates Area is essential viewing for all centers, projects and services! Although the sound is quite faint, a transcript will be available soon. “Thank you, over and over I am so totally inspired and deeply encouraged by our vast resources … continually developing … always at our fingertips … with such seeming ease! “On this day we celebrate the selfless work done by thousands of workers in India and around the world. By attracting the attention of the public to this ancient disease and the plight of those affected by it, events are organized all over the world to raise funds for the eradication of the stigma attached to the disease and the bestowing of material and moral relief to hansenians. We are delighted to make this new high resolution photo of Lama Zopa Rinpoche, taken by Ven. Roger Kunsang and enhanced by Ven. Mark Gatter, available for centers, projects and services to use. 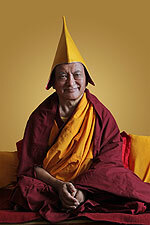 We have added it to the other high resolution photos of Rinpoche available to download in the FPMT Affiliates Area. Tulku Gyatso, resident geshe at Centro Ewam in Florence, Italy, passed away on November 21, 2011. Italian students did extensive practices as advised by Lama Zopa Rinpoche. Kalachakra initiation and the long life puja to be offered to His Holiness the Dalai Lama in Bodhgaya, India from December 31, 2011 to January 10, 2012, dedicated for His Holiness’ long life and the fulfillment of all His Holiness’ wishes. long life puja of His Holiness the Dalai Lama, please do so via our secure site. FPMT centers, projects and services should use this alternate secure site to make their donation. The deadline for all donations is January 9, 2012. 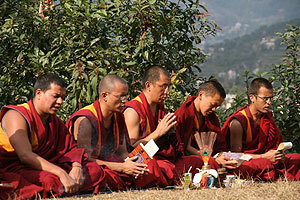 Kopan monks perform a puja on the new land for the Animal Liberation Sanctuary. “We are very pleased to tell you that construction work on new land for the Animal Liberation Sanctuary, Kopan Monastery, Nepal has begun! A temporary road has been made since there is currently no road access to the property, which is less than 10 minutes’ walk from Kopan Monastery. This was much needed as the number of rescued animals has increased substantially over the last year, to the point that nine goats are being housed at the nunnery as there is no room for them at the monastery. Dewachen Study Group in Australia, and Lopon Chok Lang Study Group in Poland have now closed – we rejoice in all they achieved while offering the Dharma as FPMT study groups. Root Institute, India is looking for a spiritual program coordinator and an office manager; Mahamudra Centre in New Zealand is looking for a housekeeper and a vegetarian cook. Proper guru devotion – correct devotion to your virtuous friends – allows you to actualize successfully all the steps of the path to enlightenment, from the perfect human rebirth up to buddhahood itself.